We wish you’d all been able to join us on FfOR's February trip to Chattanooga. Thanks to the Kruesi Center for Innovation, we not only got a 1st-hand look at the city’s "new" downtown and riverfront but also met with many of those instrumental in the transformation. Here are some highlights and a comparison of Chattanooga with our own downtown and riverfront. Chattanooga today can brag about much more than a Choo-Choo. It has been recognized as one of the world’s great cities (NPR’s Morning Edition); one of the most enlightened cities in America (Utne Reader); one of the top 10 family vacation destinations (Family Fun magazine); and one of the country’s best places to live, work, and play (Outside Magazine). But things weren’t always so bright. In 1969, the city, sometimes referred to as the Pittsburgh of the south, received word from Washington, DC that its air was the filthiest in America. Chattanooga industries were loosing ground to modern plants and offshore locations, and, with the loss of jobs, tensions were high. The city fell into a deep recession. By the early 1980s Chattanoogans decided to do something about it. They brought in consultants, started festivals, and brought together 1700 citizens to analyze the city’s strengths and weaknesses. Chattanoogans selected the city’s beauty, its river location, its mountains, and public life as their greatest assets. They identified their downtown as the place everyone held in common, the place that encompassed memories from past generations and made their community special. They set out to transform that downtown, to create a beautiful, environmentally friendly, dynamic riverfront; to improve their museums and add new ones; to renovate historic buildings; to create a pedestrian friendly downtown with a system of clean-air mini-buses; and to make improvements in the areas of education and housing. So far it sounds like Memphis in the 1980s -- the improvements begun by the Center City Commission and the recommendations for the Memphis riverfront found in the Center City Riverfront Public Spaces Plan by Mitch and March Hall and the comprehensive Downtown Plan by Venturi Scott Brown. These plans saw gardens and walkways along the MS River and included a revitalized Public Promenade on the Riverbluff. Like Chattanooga Memphis has made vast strides in redeveloping our downtown and riverfront. We now have a downtown trolley; Mud Island River Park, restored and new hotels, restaurants, the Bluffwalk, basketball and baseball stadiums, the Civil Rights Museum, Cotton Museum, Beale Street entertainment, historic buildings being restored and some waiting in the wings, and new schools. Today we lead Chattanooga and much of the country with a booming resurgence of downtown residential development. 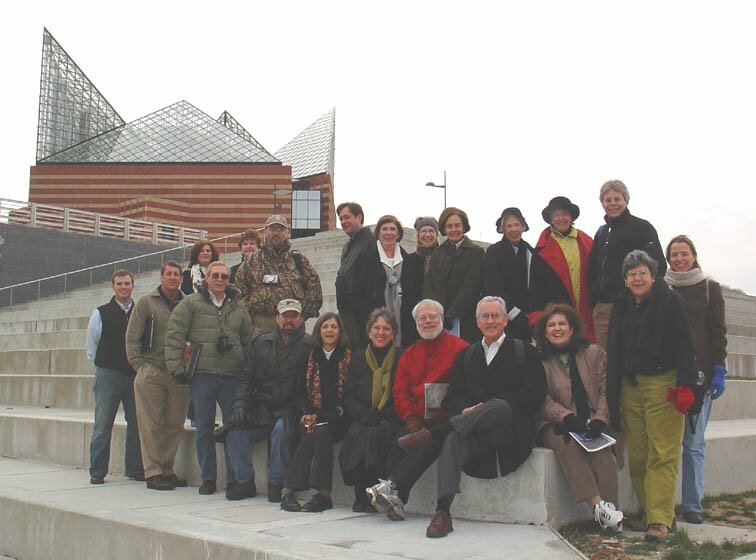 The planning process in Chattanooga brought together the community to collectively create a grand civic vision. As the plan proceeded and new phases were added, there was a continuity and affirmation of the original community goals and vision. Today in Memphis a quasi-governmental organization, the Riverfront Development Corporation (RDC), has supplanted the role once held by the Park Commission and the Center City Commission. They have facilitated some of Memphis’ earlier goals by extending the Bluffwalk and making improvements at Mud Island, Martyrs’ Park, and along Riverside Drive, but they are now proceeding with a plan for the Public Promenade that heads in a different direction and is private rather than civic in nature. The new phase, the RDC Public Promenade Plan, will turn over four blocks of public land on the Riverbluff to private developers for condos and offices. The RDC held sparsely attended meetings and then ignored much of the public comment in designing their plan, just the opposite of the process in Chattanooga. When citizens in Chattanooga said they wanted bocce fields, they got bocce fields even though planners were skeptical at first. Today those bocce fields are a popular and well-used space. In Chattanooga business leaders committed large amounts of private money to purchase land and pay for civic improvements. In Memphis the RDC has received some private donations, but most of their funding is public. In 2004 the RDC received $8,931,156 in revenue; 99.6189% of that was public money. In Chattanooga, on land along the TN River in the oldest section of town known as Ross’s Landing, there was a delapidated park. The park has been improved, the roadway narrowed and curved, parking moved, more land purchased, and walkways added, to name a few improvements. The Memphis group had the pleasure of hearing Stroud Watson, the driving force behind the Design Center, talk about the value of public space and the importance of a community’s history. Planner and former mayoral candidate, Ann Coulter led us through "The Passage", the most historic area of the riverfront which focuses on the early Cherokee history of Chattanooga. The four blocks covered by the Public Promenade Plan, often referred to as the best real estate in Memphis, extend from the River to Front Street and from Union to the Mud Island Monorail station. The land was given to the citizens of Memphis to use and enjoy forever as a common space. The high land on the Bluff provided a strategic advantage and protection from flooding and is the site of much of Memphis’ early history. Today much of it is buried beneath parking garages and other inappropriate buildings built there by the City who acts as our trustee. Everyone seems to agree that those parking lots should go, but to use this public space for luxury condos does not benefit the many Memphians who have the right to enjoy it. In Memphis we sit on a high bluff above the largest river in North America with a spectacular view across the MS River to the vast open farmland of Arkansas. We have a harbor for recreational use. We have been given the right to use as public space the most valuable and historic land in the city. Let’s use our public land wisely to create a space that reflects true civic vision -- a public realm of which we can all be proud and which we can share with future generations.